So you want a safe, attractive, traffic tolerant place for your children and pets to play on? Or, you simply want a beautiful, green lawn to add to the beauty of your home. Whatever your reason, Manitoba Eco-Network is here to help you achieve your goals. If you find you cannot attend one of our FREE library workshops, please find some basic information on this website. If you have questions that are not answered here, please call us at 204-947-6511 or email us at organiclawn@mbeconetwork.org, and we’ll be happy to answer, and research, any question you may have. Now, let’s get started! 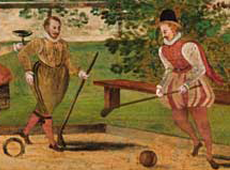 Lawns as we know them today are not natural to North America, they were imported from Europe. These short ground covers allowed approaching visitors to be seen and were a display of wealth. During the push for the “American Dream” after the war, many people stopped using their yards to grow food, and started growing grass, looking for a uniform appearance. 2,4-D was proclaimed the best thing since sliced bread, even though it killed clover, which was part of lawn seed mixes up until that point. In fact, lawn seed mixes were judged for quality based on their clover content (more about clover will be discussed later). The chemical companies then deemed clover a weed and the demand for chemicals and a uniform lawn prevailed. Until, that is, people started caring what went into their bodies. In Manitoba, Tall Grass Prairie is the natural landscape. Plants that were built for the conditions on this continent. Many lawn varieties of grasses are not as good at holding up under Manitoba’s climate, and thus require costly inputs. The first thing you need to do is be honest with yourself about your expectations for your lawn. What do you hope to achieve? How much work and time are you willing to put in? Do you expect quick results? Are you willing to see your lawn get a bit worse before it gets a lot better? Can you tolerate some weeds within your lawn? Organic lawn care is the best way to care for your lawn, not only for the health and appearance of your lawn, but for you, your children and pets, and the environment. However, if you have been using chemical pesticides and synthetic fertilizers previously, your lawn will go through a withdrawl period, and this will affect the appearance of your lawn initially. But once the nutrients and organisms, the overall soil/lawn health, are reestablished, your lawn will take off. Patience and tolerance are key. The guiding principle of organic lawn care is to nourish the soil. In this way, it differs fundamentally from chemical lawn care, which focuses on feeding the grass. Nourish your soil with natural and organic products such as finished compost (from your own backyard compost heap), well-aged manure, grass clippings and/or slow-release organic fertilizers. 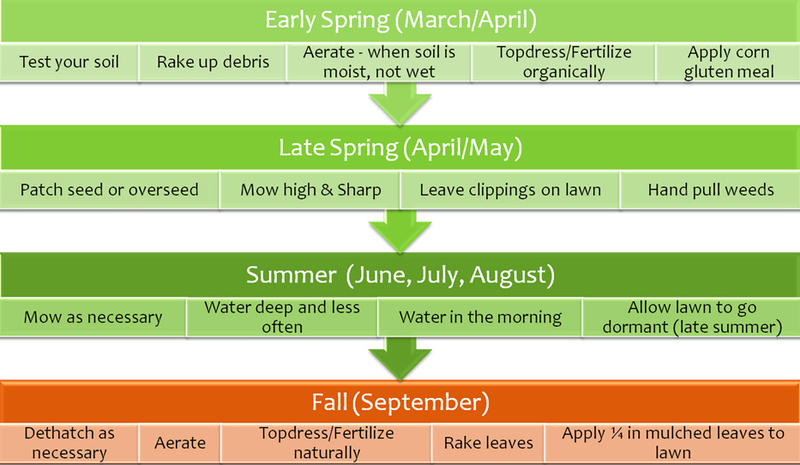 Compost can be applied in small amounts throughout the growing season but slow-release organic fertilizers are best applied in late summer – early fall. Grass clippings should be left on your lawn throughout the season, with the exception of the first and last mowing. An early spring application is also acceptable. Unlike quick-release chemical fertilizers, these natural and organic products will not burn grass or contaminate ground and surface water. 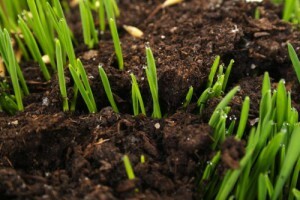 Nourish your soil by sprinkling screened, finished compost over your lawn. Finished compost has an earthy odour, spongy texture and rich-brown colour. It contributes a wide range of both macro and micro nutrients, which are released slowly over a long period of time. It also contributes micro organisms, which help decompose thatch and other organic matter. Compost should be screened before being applied to the lawn. The Province of Manitoba has restrictions on fertilizers containing Phosphorus. Lawn fertilizers must contain less than 1 % phosphorus by weight, and no fertilizers (not even zero phosphorus fertilizer) can be applied near bodies of water. For more information on composting, try Green Action Centre’s compost website or the info-line at 204-925-3778. You may wish to have your soil tested once every few years to determine if it lacks any nutrients. A test kit can be bought from most garden centers, or you can send a sample of you soil to get tested professionally. They will give you a full report of the Nitrogen, Phosphorus and Potassium levels, as well as the pH level of the soil. The report will also tell you how to remedy any deficiencies there may be in the soil. Look in the Winnipeg Yellow Pages under “Soil Testing”. Aeration relieves compaction and cultivates the soil. It is best done in the spring or fall prior to fertilization. 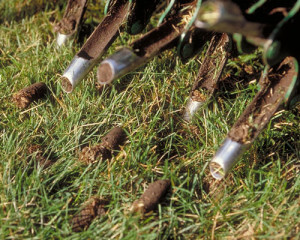 Aeration increases air and water penetration and movement in the soil. You can ensure continual, natural and free aeration by attracting and protecting earthworms in your soil. Aeration is especially important in Manitoba, as our clay-based soil tends to get compacted easily, and a compacted lawn is more prone to weed infestations. If you can’t stick a pencil into your lawn, it’s too compacted and needs to be aerated. The best way to aerate is to use a manual plug-remover or core aerator machine. These machines remove small plugs of soil and leave them on top of the lawn to decompose. Most lawn care companies offer aeration services, or you can rent a machine and do it yourself. 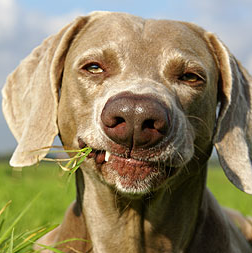 Your lawn is comprised of millions of individual grass plants. Like any other living thing, these plants eventually die. It is important to overseed once every year to keep your lawn thick and healthy. A dense lawn will crowd out weeds like dandelions and crabgrass that crop up in bare or thinly covered patches. Choose grass varieties that suit the light, moisture and soil conditions of your yard. Overseeding is also a great way to introduce hardy, pest-resistant and low-maintenance grass varieties such as endophytic perennial ryes and fine fescues into your lawn. A lawn with diverse grass types is better able to deal with and recover from stresses such as droughts, pest outbreaks, diseases and traffic. It is best to overseed in the early fall, although early spring after aerating is also acceptable. Cut down on emissions and noise pollution and use reel or electric mowers. Mowing is one of the most important aspects of organic lawn care. 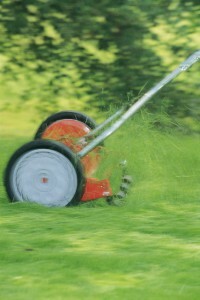 The simple practice of mowing high contributes enormously to the health of a lawn. Experts recommend at least 3 inches because it shades out sun-loving weeds and encourages good root development. Taller turf also shades the soil more than shorter turf thereby helping to keep soil cool and moist. In addition, a longer lawn has a greater ability to collect nutrients from the sun, thereby improving the overall health of the grass. A general rule is to never cut off more than one third of the blade at once. Cutting off more than one third of the blade may cause the grass plant to go into shock as a huge portion of its food factory is eliminated. It will also result in longer clippings that take longer to decompose and may suffocate some grass plants. If grass is overgrown, mow twice; first at a high setting and then at a lower one. Instead of collecting and putting clippings out for garbage, leave them on your lawn. Grass clippings are the perfect fertilizer for lawns. They are free, convenient, and chock full of nutrients and organic matter. Leaving clippings on the lawn will account for a quarter to a half of your lawn’s fertilizer needs for the year. They also return moisture to your soil and shade it from the drying rays of the sun. Another way to ensure your grass remains healthy and strong is to cut it with a sharp blade. Dull blades tear and stress grass blades, thereby increasing the potential for disease and infestations. Sharp blades cut cleaner and easier and leave your lawn healthier and better looking. Again, many places throughout the city offer blade sharpening, look in the Yellow Pages under “Lawn Mowers – Sales and Service”. Manitoba Eco-Network offers FREE Mow Better Clinics which teach participants how to sharpen their reel mowers. Rotary mower blade sharpening is also discussed but not demonstrated given the tools and the precision required. Manitoba Eco-Network also has a Lawn Library where the public can borrow lawn care tools, such as reel mower sharpening kits, for FREE! Experts agree that a lawn requires no more than one inch of water a week. Sometimes, rain will provide your lawn with all the water it requires. At other times, irrigation is required. As a general rule, water deeply once a week during the early morning. Watering during the late evening is not recommended because cooler temperatures and sitting water invite disease. Watering deeply will encourage deep root growth, which will make the grass heartier and more drought tolerant. Grass will enter a natural dormant period during a drought by turning brown, but will recover after the first rain. Providing some water during long droughts will ensure the deterrence of insects that prefer dry conditions. When laying sod or seed, supplemental watering is necessary as seeds require a consistent moisture level to germinate, and sod relies on water near the soil surface while establishing a root system. Rain and well water are generally better choices for lawn watering, as municipal water is treated with chlorine and fluoride. Both fluoride and chlorine, in excessive amounts, will harm your lawn. The best defense against weeds is a healthy lawn eco-system that will out compete weeds for space in your yard. Of course, weeds are persistent so you will have to deal with them on some level. Weeds can be pulled by hand, best done when the plant is young and the soil is moist. Try to get at least 80% of the root because the weed will grow back if there is a significant portion of the root left. There is a variety of weeding tools available, some are more effective than others. Corn Gluten Meal (CGM) is a byproduct of the wet milling process and is typically used as a protein supplement in hog feed, but is also used in the production of taco shells, pet foods, and corn chips. However, it also can be used as a preemergent herbicide, which inhibits root formation during germination. It controls crab grass, barnyard grass, foxtails, dandelion, lambs quarter, pigweed, purslane, and smartweed. It is safe for use on established turf. Do not use CGM in an area in which you are trying to establish turf grass. 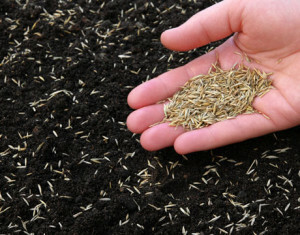 Grass seeds need at least 6 weeks to germinate. It contains 10% nitrogen by weight, thus making it an ideal “weed and feed” product. On grass, CGM is often applied at 20 lbs / 1000 sq ft; in garden situations, the rate may vary from 20 to 60 lbs / 1000 sq ft. In order to be effective, it should be applied when the snow melts in early spring, but can also be applied in mid summer and late summer to early fall, to catch the seeds that have blown in during the summer. Many garden centres carry CGM or a trademarked version of it, and it can be purchased at Feed Rite Mills (17 Speers Rd, 233.8418) and Sage Garden Herbs (3410 St.Mary’s Rd., 257.2715). Every consecutive year you apply CGM – assuming proper timing and rate – should give you better results than the year before. The use of Corn Gluten Meal as a herbicide was discovered by Dr. Nick Christians at Iowa State University. For more information, see: www.gluten.iastate.edu. More and more people are choosing to reduce the amount of lawn space on their property or have decided to eliminate their lawns altogether. Doing so will reduce your water consumption and decrease the amount of energy and resources going into lawn maintenance. Some alternatives include: Vegetable Gardens, Rock Gardens, Trees and Shrubs. Eartheasy has some good information on lawn alternatives. When planting, consider using native species. They’ve adapted to our climate naturally, need very little maintenance and virtually no water. Be sure to use species that are native to your specific bioregion. Contact the Living Prairie Museum at 832-0167 for information on native plants and local sources.